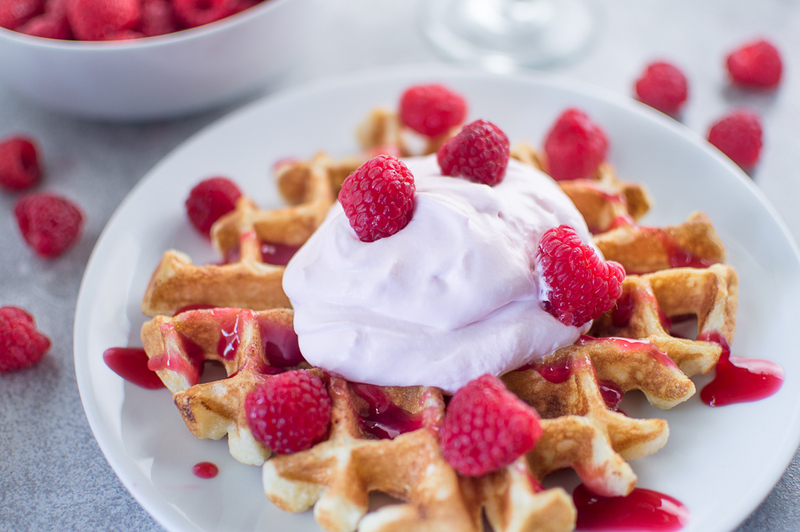 First make your raspberry drizzle. Add the sugar, champagne, and raspberries to a medium pot, and stir the ingredients making sure everything is blended. Bring the ingredients to a boil, then cook on medium heat for about 5 minutes. Then, strain the raspberry mixture through a strainer to remove the raspberry pulp. Mix the cornstarch with the liquid portion. Place this liquid back in the pot and cook for about 2 minutes (the sauce will become thick). Set the sauce aside. Next make your raspberry cream. 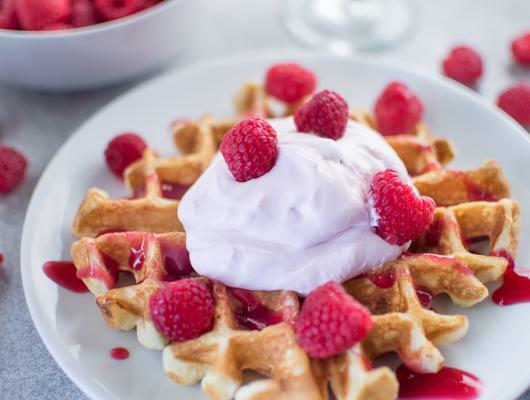 Start by adding the remaining raspberries, ¼ cup sugar, ½ cup champagne to medium sauce pot. Bring the mixture to a boil, then cook on a medium heat for 5 minutes. Strain the raspberries as you did with the raspberry drizzle part of the recipe. Place the remaining liquid in the refrigerator for about 5 minutes until it has cooled down. Once the raspberry liquid has cooled down, add the raspberry liquid, mascarpone cream, 3 tablespoons of sugar, and heavy cream to a mixer. Mix the ingredients for a few seconds then scrap the bowl. Add more sugar at this time if you want the cream to be sweeter. Then, mix the cream for about a minute until it just begins to look like whip cream. Don't mix it too long, because you don't want the cream to be to firm. Last but not least- make your waffles. Mix your wet ingredients (excluding the melted butter) together. Then, mix your dry ingredients together. Combine both the wet and dry ingredients together. Then, add melted butter. Remember not to over mix batter, because it will make the waffles tough... Cook waffles in your waffle cooker according to your waffle makers instructions.